Kit contains tests for measuring seven critical water quality factors, including pH, Nitrate-Nitrogen, Phosphate, Dissolved Oxygen, Alkalinity, Clarity (Turbidity) and Temperature. Also includes a reference guide for Natural Water Monitoring and an interactive CD-Rom. 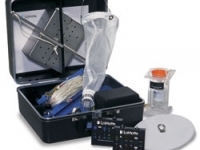 Durable, reliable sampling gear and measuring devices designed for field testing. Introduces the basic concepts of water chemistry by testing tap water from any source. 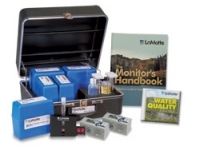 Kit includes tests for ten key factors, including Chlorine, Copper, Dissolved Oxygen, Hardness, Iron, Nitrate, pH, Phosphate, Temperature and Coliform Bacteria.